Summer is over and the air of September is calling me back to the trail. I make a last minute decision after looking at the weather to head out. Hurricane Irma has been named. She is big and ugly but it will take her over a week to reach where I’m headed. This is the beauty of section hiking. I did a mini-hike over the summer around Fontana. The shelter there is referred to as the Fontana Hilton. This is because it is the only shelter on the trail to have hot showers and electricity. Actually, the shelter is not connected to the showers but they are relatively close by. There is a really nice Visitor Center as well. I met a couple in their 70s who volunteer every year at the Center. I learn that Fontana Dam was built in the 1940s during World War II. Many saw it as a symbol of technological greatness and it added to morale during wartime. 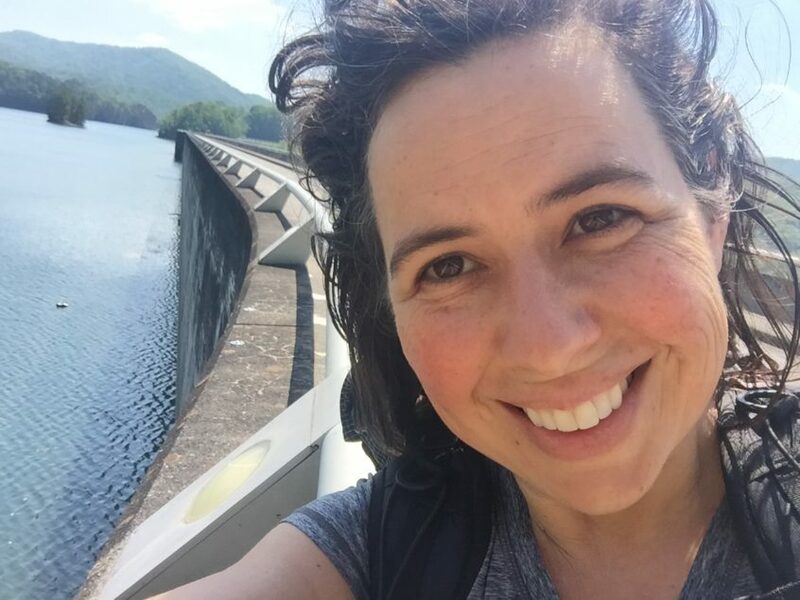 The hike south of Fontana Dam has many views of the lake that enchant me. I end up stopping often to take it all in. Halfway between Fontana and Franklin, I reach the Nantahala Outdoor Center (NOC). I ask myself if this is a fun wilderness park or a man made monstrosity? I decide it’s both. Rain is in the forecast for the evening so I secure a bunk in a bunkhouse and take a hot shower. I try to hide my end of day waddle that I attribute to lactic acid as I walk into the center of the NOC. I ask for seat outside at one of the two restaurants that overlook the river. I pull out a copy of The Power of Now by Eckhart Tolle. I read it years ago and saw it on my book shelf recently. It seemed to call me to read it again so I brought it on this section in spite of it’s weight. I read part of my current chapter and then put the book down to focus on being present. That is the point of the book after all. I notice the juxtaposition of nature and commercialism but for some reason, I don’t feel like judging it like I normally would. My pizza and beer arrive and I pay attention to how freaking good they taste. Soon into my second half of this section, I meet my first south bounder. A south bounder, or SOBO, is someone who starts in Maine and will finish in Georgia. His trail name is Rock. He tells me he started hiking the end of May. I question him about this as I know that Mount Katahdin doesn’t open till June 15th. He smiles and explains how he flip flopped starting south of Katahdin then headed north before beginning his true south bound hike. Rock has made great time which is fortunate because he is almost out of money. In spite of this, his optimism abounds and I have complete faith he will make it to Georgia which is a week away with his 20+ mile per day pace he has achieved. Another contrast strikes me as I look at him closely. He is emaciated and if I had to guess, down to 5% body fat. But he is glowing to me. He has a beautiful light inside him that I can see. Not with my eyes but with my heart. He has figured out how to BE. And BEing looks gorgeous. The next morning I meet four Hispanic couples from Jacksonville, Florida. The are originally from all over South America: Columbia, Venezuela, Costa Rica. I have listened recently to an hour of my conversational Spanish lessons and say with a little too much confidence, buenos días! A woman beams and start speaking Spanish very rapidly. I have to interject and explain, no hablo muy bien. She laughs and says she was sure I was a native speaker based on my greeting. I laugh and a new friendship is forged. I hike alone during the day, stopping often to try practice BEing. I am ashamed how little I do this anymore. What happened? I think back to my first memory of napping in a diaper under a tree and waking up to notice the wind. I wasn’t yet two years old but I remember. I lifted my head, felt the wind, noticed the silence and then went back to sleep. I remember college, early in my relationship with Mike. I stopped thinking about the past and worrying about the future. The only thing that mattered was the present moment. It felt light and freeing. This section of the trail, like much of the Smokey Mountains has burned parts from recent forest fires. The fires were tragic to plant, animal and human life. But now there are wild flowers blooming and I have rare views due to the dead trees. Life follows death. I finish my section knowing Hurricane Irma will be arriving within a day or two. I head home. This has been my most beautiful hike to date. I think of the mountain lake, of wildflowers blooming, of Rock and of my new Hispanic friends. It’s time to remember how to BE again. Did you get to visit the last virgin forest on the east coast? Joyce Kilmer memorial forest is a sight NOT to miss and not far from Fontana Dam, hope you got to experience it, if not YOU MUST! I have thoroughly enjoyed reading all of your updates along the way. Thank you for taking the time to keep us all updated. I can only imagine the wonderful sights you’ve seen on this journey, and I cannot begin to imagine how much this has changed your life, heart and soul.